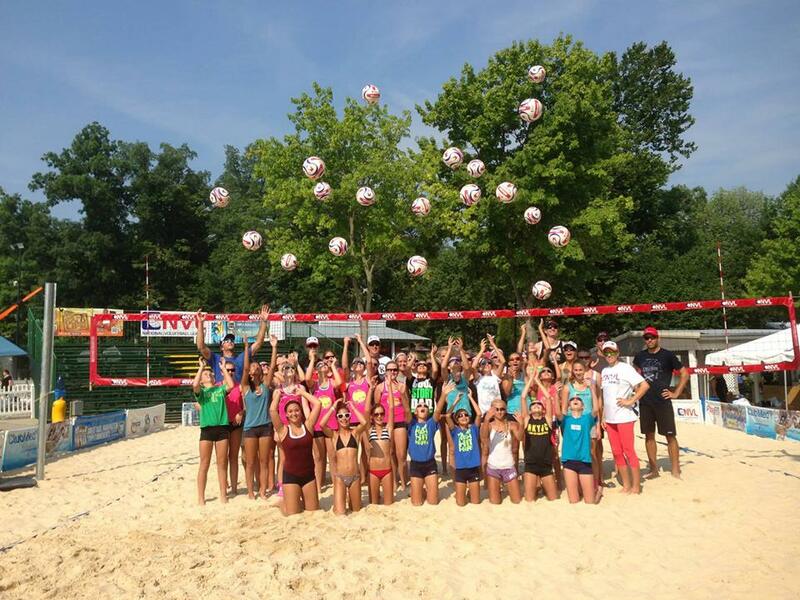 (May 22, 2015) The National Volleyball League will host a pro and amateur tournament with a junior clinic next weekend in Ocean City, May 29-31, for the first time. Beach volleyball teams can sign up until Tuesday, May 26, for a spot to compete for the $75,000 prize purse. The National Volleyball League Pro Qualifier kicks off the weekend activities on Friday, May 29, from 9 a.m. to 6 p.m. between Dorchester and Talbot Streets in view of the Boardwalk, where spectators can watch beach volleyball all weekend for free. Last month, at a tournament in Madeira Beach, Fla., 27 men’s teams and 16 women’s teams registered for the qualifier, and 12 teams were in the main draw for a total of 67 teams competing throughout the weekend. It was one of the largest registrations to date and the organization expects the same numbers in Ocean City, he added. There are 16 teams per gender, with 10 teams automatically entered into the main draw and two wild card teams. 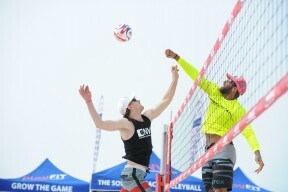 Interested pro teams can sign up at: www.thenvl.webconnex.com/OceanCityReg2015. On Saturday, May 30, the main draw matches begin at 9 a.m. and will continue until 6 p.m.
Beginning at the same time, the National Volleyball League’s amateur series, NVL RIZE, is partnering with the Delaware Volleyball Academy to host a junior tournament. It will start with pool play on Saturday morning and conclude with teams moving into single elimination brackets on Sunday. It is open to both boy and girl teams in 12U, 14U, 16U and 18U divisions. Junior teams can register via www.NVLRIZE.com. A PlayFIT Foundation hosted “Clinic with the Pros” will take place from 2-3:30 p.m. on Saturday. It gives participants an opportunity to learn warm up and stretching techniques, volleyball fundamentals and other coaching tips from NVL pros. The clinic is included in the tournament entry fee. The final day of competition begins at 9 a.m. Sunday, May 31, with the quarter and semi-finals of all age divisions taking place and the NVL pro finals tournament continuing as well. The women’s championships take place at 3:30 p.m. with the men following at 5 p.m. on Sunday. “Fans have an opportunity to watch world-class beach volleyball competitions in a festive and family-friendly atmosphere. It’s free to attend and fans can win fun prizes while hanging out on the beach,” Hannemann said. A variety of contests and giveaways will take place at the tournament all weekend long including on social media sites. Fans will have the opportunity to win prizes from two of NVL’s main sponsors, Mikasa and Australian Gold, in addition to NVL gear. Some prizes include Mikasa volleyballs signed by the NVL pros, Mikasa keychains, drawstring bags, bracelets, and Australian Gold will be providing sample sunscreen, bags, Frisbees and T-shirts. General public admission is free and fans are asked to visit the information booth located at the tournament site to pick up an event ticket for entry to the bleacher area and to receive a complimentary gift upon arriving. There will be VIP tickets available for purchase and they include a VIP private area on center court, lunch and non-alcoholic beverages, an autographed NVL volleyball from the Pros, free registration for the “Clinic with the Pros,” access to all evening player parties, a complimentary copy of VB Soul and the NVL Tour magazine. VIP Tickets cost $50 for one day, $75 for the weekend and can be purchased at: www.thenvl.webconnex.com/NVLVIPtickets. Thousands of people pass through NVL tournaments on any given weekend and the tournament will be aired for free on the NVL Network. It can be watched live onTheNVL.TV. The Ocean City Championships are one of eight professional events for the NVL in 2015 and they will make stops in Florida, Milwaukee, Cincinnati, California and Seattle. The National Volleyball League was established in 2010 and built by players who are united to create a sustainable future for pro beach volleyball in the United States. NVL is the only national platform for current professionals and players of all levels to showcase their talents and pursue their goals in the sport. The free to attend Ocean City championships will take place next weekend between Dorchester and Talbot Streets, May 29 and 30, from 9 a.m. to 6 p.m. On Sunday, May 31, volleyball tournaments will take place from 9 a.m. to 5 p.m. with the women’s final taking place at 3:30 p.m. and the men’s starting at 5 p.m.
All of the tournament details can be viewed at www.thenvl.com.